I'm having quite a bit of difficulty with meaning of "affordable" as it is being discussed in this and other analyses of the Baucus proposal. Just as insurance does equal care, premiums are not equivalent to cost. Affordable healthcare should mean that the cost of treatment is within the means of the patient. Where are these people supposed to get the money to pay for actual care after laying out so much on premiums? A recent Kaiser Foundation report about the Massachusetts experience noted 17% of those with insurance could not afford to get care and 26% had incurred medical debt. that are bankrupting individuals and all levels of government. Can you send me a link to that KFF study? I would be interested to read it. I suppose one response is that most reforms will leave some with no net improvement; maybe I misunderstand M, but it's not clear that people in such situations (usu low income, bad employer plan with relatively high deductibles, copays, +/or premiums) are worse off than before the Connector/Commonwealth plan. 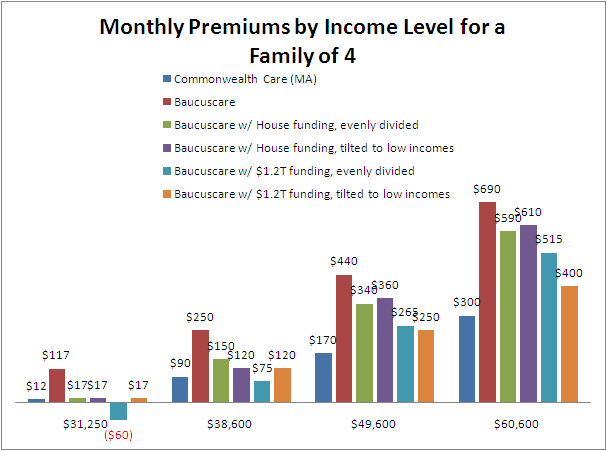 I'm also not sure what happens to the Connector plan when/if national health care plan ((Baucus + HR3200)/2) is passed; does your chart illustrate how people would automatically become worse off, or how they would ignore the federal plan in favor of the Massachusetts one?